Available July 12 directly from the author. $24 including postage. Email benjamin@newyorkwanderer.com. I am thrilled to announce the publication on July 12th, 2014, of my latest book: East in Eden: William Niblo and His Pleasure Garden of Yore. This beautifully illustrated volume is available now by sending $20 including tax and shipping in the USA via PayPal to me at feldman_benjamin@hotmail.com (and email me your mailing address) and will be on Amazon within a couple weeks as well as at Green-Wood Cemetery bookstore. At long last we have the full scoop on William Niblo, the premier impresario of antebellum New York who was oddly disinclined to put the spotlight on himself. His spectacular and nationally-known venue, Niblo’s Garden, defined for over three decades the high end of New York City’s entertainment industry, with flower-filled gardens, night illuminations, balloon ascensions, and a full theater showcasing operas, acrobats, singers, and dancers. Ben Feldman has uncovered a wealth of detail about the luxurious foods and appointments Niblo’s patrons enjoyed. More importantly, he has penetrated Niblo’s personal reserve, and, thanks to assiduous research in newspapers and public records, he brings us the backstory of this Irish immigrant’s rise to fame and fortune. Finally William Niblo gets his due. The many triumphs and setbacks of shrewd businessman William Niblo are introduced to the reader in this richly detailed account of entertainment in nineteenth-century New York. Framed by two encounters with his mortality (being locked in his wife’s tomb at the book’s start and then his own demise at the close), this account of Niblo’s life leads the reader through his career from coffee house owner to pleasure garden proprietor, touching on the various stars that graced his stages, encounters with the infamous P. T. Barnum, his ties to the Astor Place Opera House (and Astor Place riots), his pre-marital “indiscretion,” and frequent legal battles. With the Black Crook, Niblo’s Garden earned a prominent place in theatre histories; to have the details of the proprietor’s life filled in with such vivid detail is a joy. —Naomi J. Stubbs, Assistant Professor of English, LaGuardia Community College, CUNY; author of Cultivating National Identity through Performance: American Pleasure Gardens and Entertainment. Ben Feldman has done it again! For his third book, as for his first two, Ben has selected one of Green-Wood Cemetery’s most fascinating permanent residents, tenaciously run down every possible research lead, and woven it all into an incredible tale. Ben’s work is what makes history so fascinating: no one could make up the larger-than-life story of William Niblo. 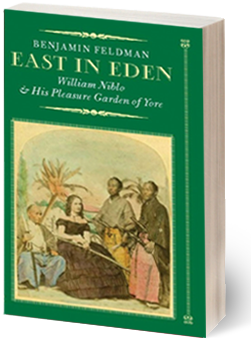 Benjamin Feldman’sEast, In Eden: William Niblo and his Pleasure Garden of Yore is a lovely monograph of William Niblo and his famous 19th century Pleasure Garden. The book takes us back to the beginning of his career as a barkeep, restauranteur and coffee house owner and then to his creation and sustenance of his Pleasure Garden, which was specifically geared towards genteel women and families. No “unaccompanied” women were admitted, and the prices favored the upper middle class members who considered the pleasure garden to be an exurban delight! This book describes in clear and passionate language Niblo’s Garden’s scenes of passive entertainment — from lavish performances of plays, music, acrobatics, circus acts, Italian opera and vaudeville scenes — to delicious food! At 7pm on July 12th we will celebrate the publication with “A Night At Niblo’s Garden” at Green-Wood Cemetery. See http://www.green-wood.com/event/a-night-at-niblos-garden/ for further details of this exciting outdoor event.